Dr. Joshua “Josh” Culbreath knows the true Stan Cottrell, as a man and ultra distance runner, up close and personal. 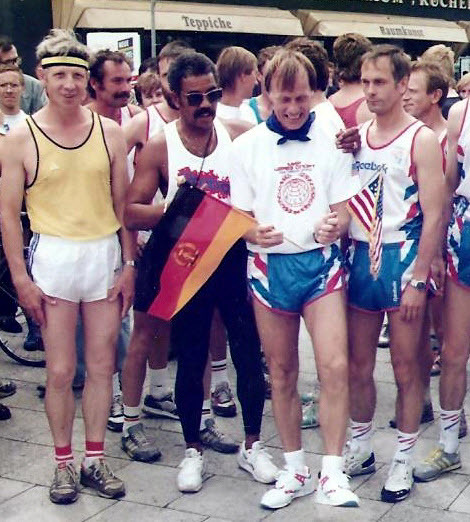 In 1990, for 400 miles he followed Stan’s “Historical Freedom Run” celebrating the tearing down of the Berlin Wall, the “Wall of Terror.” He reports he “saw Stan do what no one else has ever done.” He has known Stan for decades now. Who is Josh Culbreath? What are his qualifications? The “short list” — Olympic Medalist, two-time World Record Holder, the first great Black intermediate hurdler, inductee into five Track and Field Halls of Fame and the Marine Corps Hall of Fame, celebrated Track and Field Coach for many U.S. and international teams, Honorary Co-Chairman of Friendship Sports Association. Track & Field, human performance, and achievement are what my 80 plus years have been about. I have been blessed to have been a two time medalist on the 1956 Olympic Team and now a member of 5 Track & Field Halls of Fame. Years ago, a close personal friend, Mal Whitfield, called me and asked me to drive a van for Stan Cottrell from Berlin to Moscow. I am not going to get into all the details because what I witnessed is the important part of this narrative. Day after day, I drove a van behind Stan as he ran 50 miles over and over again. I never knew a human could do this. I was witness to a dimension I never knew was possible. We started from the Brandenburg Gate in Berlin on the day of the official opening between East and West Berlin. There were more than 100,000 people who cheered us as we began this great initiative. Stan was joined by many athletes and even the previous Olympic Gold Medalist in the Marathon. It was a phenomenal sendoff. All along the way, thousands of people were along the road with smiles. We were running through Poland where we felt time had virtually stood still since Hitler had invaded in 1938. When Stan runs, anyone can join in and run as much as they want. People of all ages would join in. Some went only a few feet…the distance did not matter. We all knew we were part of something far bigger than ourselves. For a moment in time, the magic of people laughing and playing together…not bound by ideologies or politics…we were recapturing those moments we all knew as children… we played together, and the world was a better place. I have never experienced anything as powerful in my sports career as what Stan does. In today’s world, we go to an event and security measures are rigid. A wall exists between the spectator and participant. Stan’s world is just the opposite… Stan welcomes all to run. The people shake his hand, they get their picture made, and for their moment in time…the event brings significance and their world becomes significant. Stan runs and runs…he brings a message of hope. The people seem to identify with him as he brings his message of friendship, and every person has a victory to give regardless of where we live our lives. I was witness to sports in a whole new way. What Stan does is “Sports in Diplomacy:” not the kind our politicians bring to the table. This is about people to people communications, and that is contagious. Everyone he meets is inspired to want to be better… He is an igniter! Stan runs and runs…he stops and listens…he is a life changing experience. I witnessed first hand the uniqueness of what Stan does. The world is a better place because of what he does. He is making a difference. Wish I could share all the wonderful, true stories the outstanding Olympian and “Hall of Famer,” Josh Culbreath, has shared personally with me about the way it was in track and field in the “early days,” about his relationship with Stan Cottrell, about running with Stan when the Berlin Wall fell and more… Josh is a remarkable man, and there’s a very good reason he admires another remarkable man, ultra distance runner Stan Cottrell… who amazingly shows that he can keep running and running long distances, day after day, for days on end.